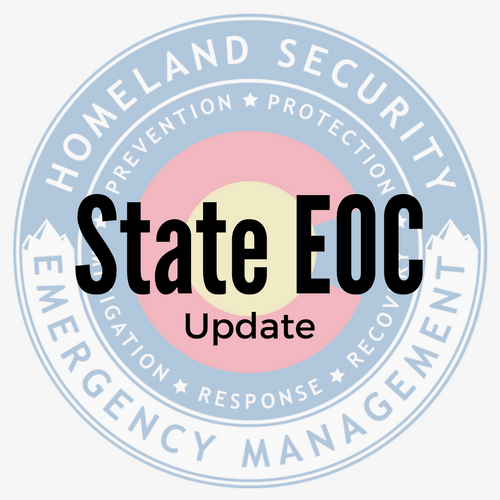 The State Emergency Operations Center activated at 1 p.m. on January 24, 2017 to support Costillo and Dolores counties. The counties have exceeded their local capabilities to respond to a severe winter weather storm in their region. The San Luis Valley (SLV) Regional Field Manager is providing direct support and technical assistance at the SLV incident command post. 1. Establish and maintain situational awareness by staying in contact with local jurisdictions and other response agencies. 2. Be prepared to provide resources to local jurisdictions upon request through proper process in an effort to conduct a coordinated State - level response. 3. Ensure all resource request documentation is accurate, complete, and understandable. 4. Assist in the development and coordination of State - level messaging and provide support to local Joint Information Centers, as necessary. 5. Monitor weather conditions across the State / FEMA Region. 6. Be prepared to initiate State - level response for incidents or events outside of impacted areas. 7. Ensure coordination and support to the Disaster Assistance Center (DAC). 8. Coordinate appropriate messaging and support staff managing the State Individual Assistance Program. 9. Identify all critical infrastructure at risk and the potential impacts.